This post is part of a series called Nuscheli Lifestyle, which is here to highlight the many different uses of Nuscheli cloths. Introducing solids to your baby is an incredible (and incredibly messy) milestone! Whether you puree your own baby food, buy pre-made pouches of baby food, or skip spoon-feeding altogether and let your baby self-feed, the goal is always to get most of the food into your babies mouth instead of next to it. We all know that this skill is rarely met from the start and requires a lot of practice (and patience for parents)! The messiness is tedious, but the bib doesn't need to be! From experience, anything to make this milestone and mess easier on us parents and caregivers is usually greatly appreciated. Our Nuscheli scarves make for a perfect bib for a few reasons. To begin, they tie on easily and cover a lot of surface to catch most food bits (or splatters) falling from and out of your baby's mouth. Their pure organic cotton content makes them extremely absorbent and keeps your babie's neck and clothes dry and clean while working on this masterful eating skills. If the Nuscheli gets very soiled (and you can't stand it any longer! ), you can untie it, flip it over and use the clean side of the folded triangle for a "fresh" bib and continue the task of eating. 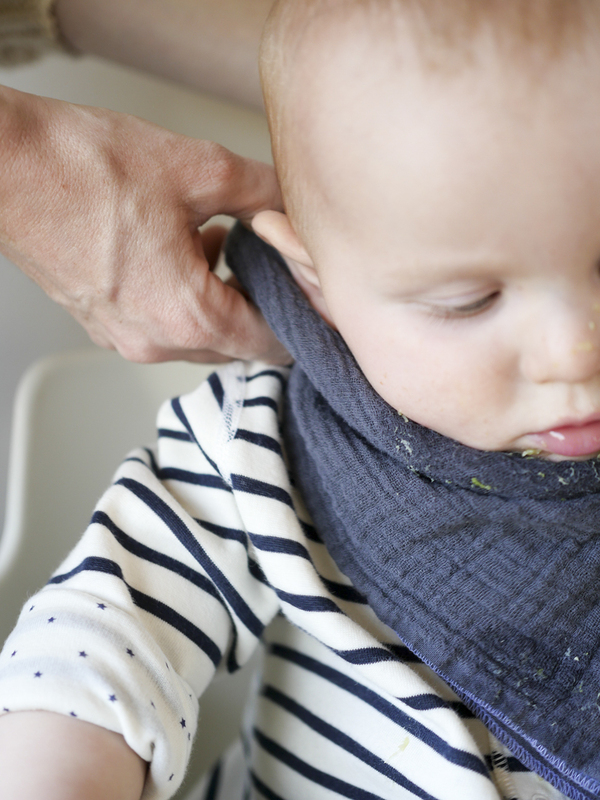 When your baby is done eating, Nuscheli scarves can be used to wipe your babies messy face and hands. Two in one! Simply use a clean side of the Nuscheli and dampen it, or not, to wipe up the mess. The fabric is soft and absorbent, and most importantly, its allergen free and therefore safe to use on babies delicate skin to clean it after a meal. You can also wipe down the highchair tray or table top with the same Nuscheli. If you are home for this meal, we recommend just rinsing the soiled Nucheli in the kitchen sink with mild soap and hanging it up to dry afterwards. Because of its lightweight gauze composition, it will dry quickly and can be put back to use again very soon. If it's in a disastrous condition after the meal, then it might be better to toss it in the laundry for a good soak. If you are planning to be out of the house, these are easy and lightweight to take along in your diaper bag. Pack one or a few to use as a bib, burp cloth, cute bandana, scarf! They are so versatile and practical on the go, especially.